Many users of conference calling technology will have undoubtedly endured the frustration of substandard audio quality during a call. From the muffled sound, dropped calls to poor quality audio it can become frustrating very quickly. Utilizing the mute function during a conference call helps eliminate annoying noise from the background. Remember to mute your own line when you are not talking and unmute when you are required to talk. It is necessary to understand how to increase and decrease the call volume as required. It is a good idea to check that your speakers and microphone are working as they should before your live call. For the best performance utilize a landline for your live conference call along with a good quality headset rather than a cell phone. Cell phones may be reliable but a landline will ensure the call quality is much higher. Utilizing a hardwire headset will ensure you will be able to hear the call much better and guarantee your voice will sound much clearer. Which is Best VoIP or Analog? Analog is the better option when you have a choice between VoIP and analog. Analog is your standard landline and VoIP is online audio. It is possible to host a conference call integrating the audio from your phone to help ensure the best possible audio for your call. 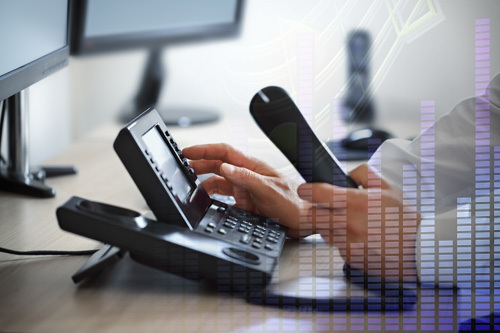 The disadvantage with VoIP technology is that it is dependent on a connection to the internet which is not always reliable. A busy or slow network can create issues on your live call. Taking action to minimize the amount of background noise you have during your call will benefit everyone on it. When hosting a call you can help to minimize noise in the background with the help of curtains, carpets, and indoor plants. Remember the location of your microphone at all times. Many times people forget where the microphone is located and end up speaking into the air and the other callers are not able to hear them. There are many different reasons why echoing can occur. To help prevent echo, position the microphone, as far as is possible from your speaker system as is practical. Another tip is to mute your phone while you are on the speakerphone. If nothing else works you may need to stop the call and then restart it. While this may not be ideal it may be the only viable option that works. If this does not solve your issues you will most probably need to contact your call operating service for support. When planning to hold a live conference call it is vital to utilize the services of a high-quality call provider. Not utilizing the services of a high-quality call provider could mean all your hard work and planning will be for nothing. When searching for a suitable provider check out customer reviews and testimonials. These will provide you with a better understanding of how the provider operates and the quality of their service. A successful conference call is vital to get the message across for your business. You need to avoid any distractions interrupting calls with important clients. For a successful call make sure the room is kept quiet and the talking is controlled by the main speaker.